Since 1995, ifva has been working hard to promote innovative media creation in the form of short film, video and interactive media, among all walks of life. 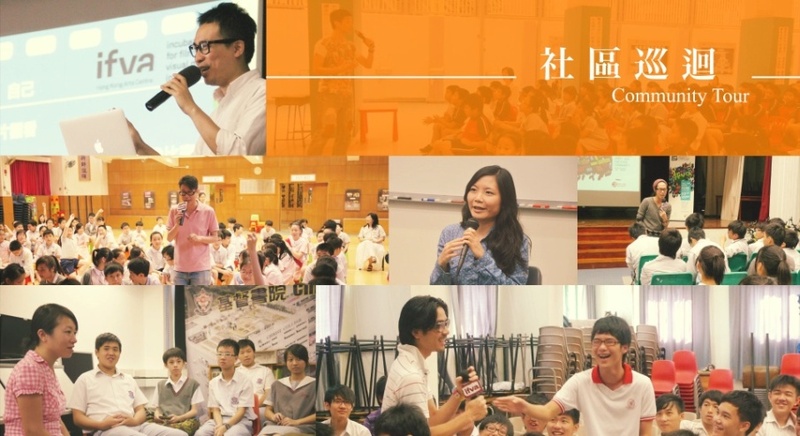 Apart from the short film and video competition every year, we will visit local tertiary, secondary and primary schools, hoping to encourage a creative use of media among teenagers, and also discover and cultivate new generations of film / video makers in Hong Kong. ifva will lead visual artists, judges, alumni as well as their winning works to visit local tertiary, secondary and primary schools. With the aim of enabling exchange of experience and stimulating creativity of students, ifva attempts to encourage teenagers to express their inner world with media creations. Apart from artistic sharing of ifva awarded works, community tour also includes the seminars with liberal studies and moral education‘s perspectives. By showcasing the shorts produced by the ethnic minorities’ youths, the seminar will introduce “All About Us” , an annual community programme organized by ifva, and invite the instructors and students to share their stories behind the scenes. The audiences will get known to the ethnic minorities’ groups as well as gain civic consciousness on respecting.